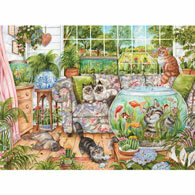 Bird House is a 300 piece jigsaw puzzle designed by artist Debbie Cook. The interior of this house is a tropical bird paradise. Colorful parrots, lovebirds parakeets, cockatoos and more fly around and perch on branches throughout the scene.